Having your dryer vent cleaned is a small investment that can go a long way. Even if you clean your lint trap after every single dryer load — which you absolutely should be doing — your lint trap is not able to catch every single bit of lint. 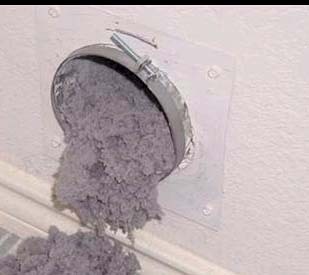 This means that over time, a significant amount of lint can build up in your dryer vent. If the hot air from your dryer is not able to circulate freely and lint has built up in the vent, the hot air could potentially ignite a fire. In addition to making your home a safer place, having your dryer vent professionally cleaned also increases your dryer’s efficiency. Your clothes dry faster and you save time and energy. Also, with your dryer’s increased efficiency, it doesn’t have to work as hard which increases its longevity. When you hire KIWI’s professional dryer vent cleaning services, one of our friendly technicians will move and disconnect your dryer, vacuum any lint build-up or other potential hazards, then reconnect and move your dryer back into place making sure it’s in good working order. Call KIWI today to schedule a dryer vent cleaning appointment.